Adjustable height desks and active seating products are now common pieces of furniture to see in many offices, schools and other applications that require you to sit while you work. The standing desk chair market was dominated by a few select brands for many years but with the increasing popularity in the category, more and more products are being developed. What typically happens with new product categories is that manufacturers flood the market with low priced products. They do this in an effort to grab some of the market share based off price alone. With so many new products suddenly available, it can be tough to know which ones are good and which ones won’t work for you. The Kore Office Plus Sit Stand Chair has been around for quite some time and has always had a lower price point. It is now competing against a lot of the new, low priced products that we just discussed. 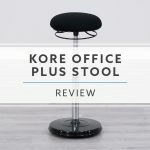 Is the Kore Stool still a nice option for people that would like to have a lower priced option? 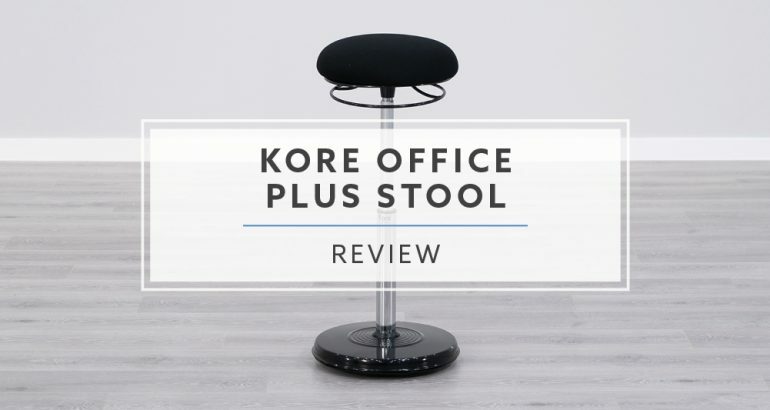 Our goal with this review is to make that an easy question for you to answer, ultimately letting you decide if the Kore Stool will be a good fit for your needs. Need help? Get our Free Standing Desk Chair Buying Guide! Kore Design LLC is a company that was founded by Jon Elmaleh. He is responsible for designing various versions of the Kore Stool product line dating back to the 70s. 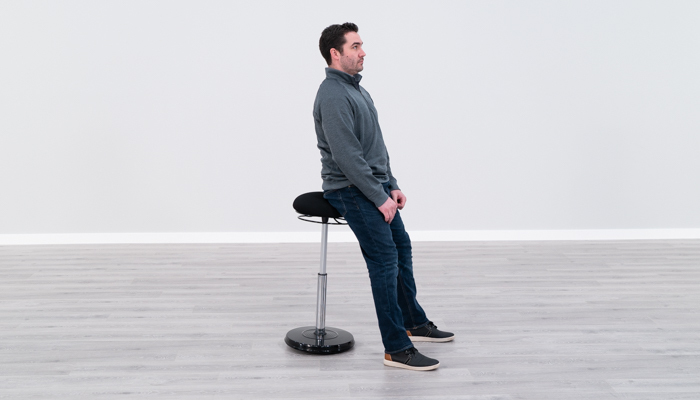 The newest version of the Kore Stools were designed in 2009 and continue to focus on producing products with bases that allow the user to rock and move while they work. Their original model received a design patent and they have been the recipient of a handful or awards for their design. The stools are very successful in schools and office environments that encourage movement. 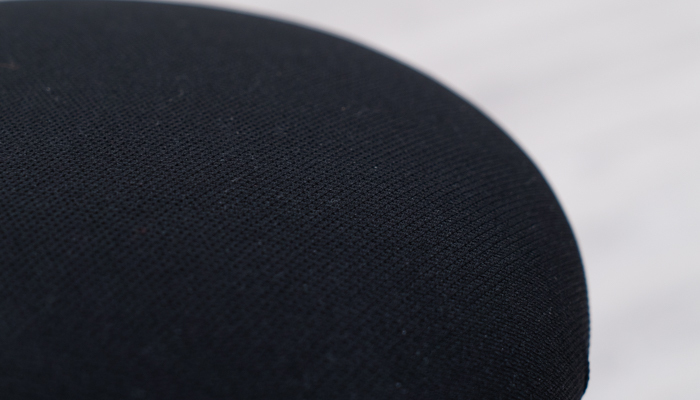 Soft padded cushion for extra comfort. The Kore Sit Stand Chair is available with a black base, silver piston and either a black vinyl or black fabric seat. The Kore Stool is not sold by Kore Design LLC directly and they do not have a return policy. The return policy on your Kore Stool will vary, depending on the seller you purchase from. Kore Stools are warranted for three years. There are no parts that are excluded from the warranty. Three years is a middle of the road type of warranty in the sanding desk chair world. 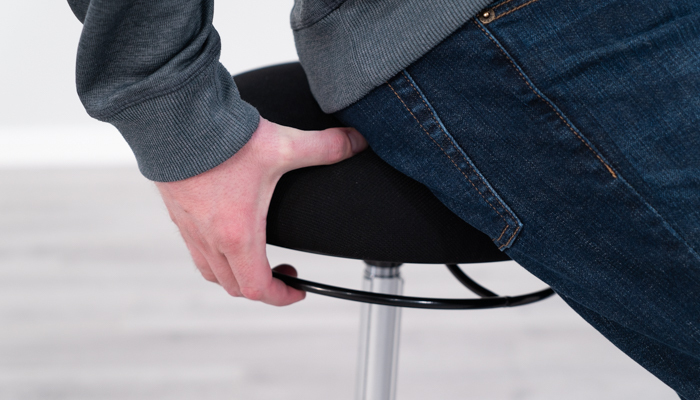 Many chairs have a warranty of five years or more but most chairs around the price range of the Kore Stool will have warranty periods of one year. 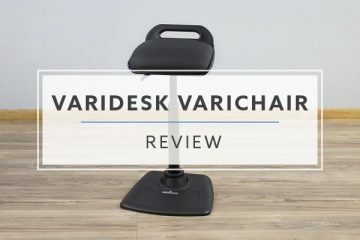 We Have Ranked The Best Standing Desk Chairs For 2019! The Kore Stool ships within a couple days after placing your order. It ships via FedEx or UPS ground and arrives within a few days after shipment. The box it arrives in is small and weighs about 20 lbs. It should be no problem for one person to carry it into the office themselves. I found the chair to have good packaging. The parts were well protected, and I did not find any signs of damage due to shipping. The Kore Sit Stand Stool requires assembly, but it should only take a couple of minutes. The chair comes in three parts: the base, cylinder and seat. During assembly, you need to place the cylinder into the base and then set the seat on top of the cylinder. Your final step is to sit on the stool to lock the parts into place. The Kore Stool is made in China of lower end parts, which is why it is one of the lower priced standing desk chair options out there. The base is made from stamped steel and features a high gloss powder coated paint finish. The steel base feels durable, but I do question how long the paint finish will last. High gloss finishes are usually more susceptible to scuffing and scratching. We had a chunk of the paint come out during our recent move to a new office. The bottom of the base is covered with a rubber coating. This rubber coating is meant to protect the surface that the chair is being used on, while also providing some more stability for the chair. The pneumatic cylinder is non-rotating and has a chrome finish. It has a wide adjustment range and operates smoothly and quietly. I did not notice signs of grease build up as we have seen on other lower priced chairs. The seat pan is made from plastic. The foam is thick, but it does not give when you sit on it. The seat remains firm all the time. The fabric is not the as nice as the fabric on higher-end chairs, but it is still commercial quality and feels like it will hold up well. 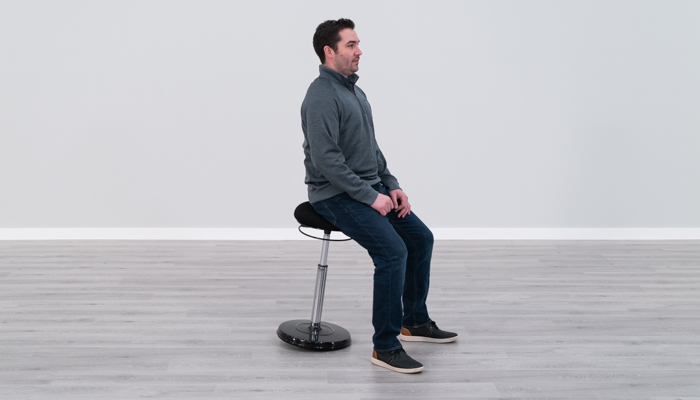 With sitting mobility, we are looking at the chair’s ability to move around with you sitting in it. Giving a chair mobility is usually done with wheels. 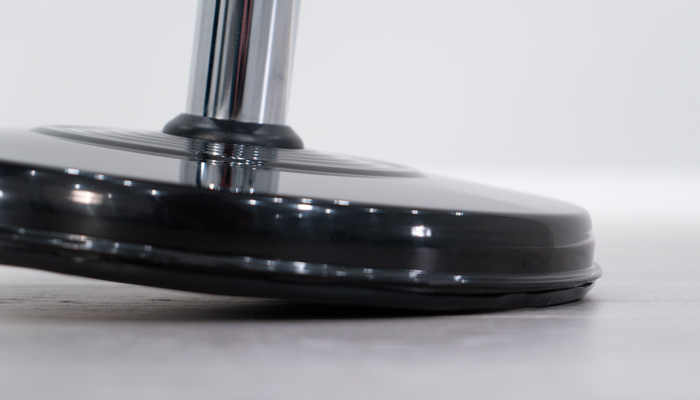 Wheels allow you to roll to different areas of your desk or office without having to get up every time. Wheels are also helpful to get you into your optimal typing position right away. 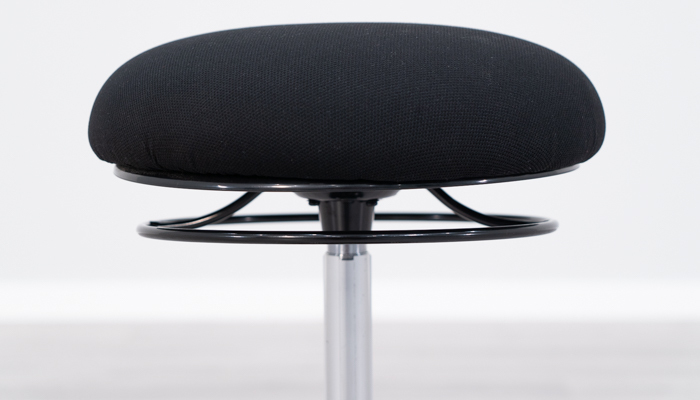 The Kore Stool does not have wheels but instead has a wobble base. 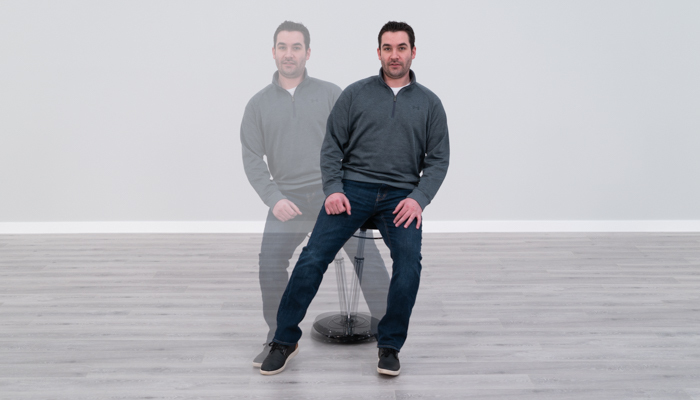 A wobble base allows you to wiggle around to move the chair more so than a chair with a stable base, but a wobble base won’t have anywhere close to the same mobility as wheels. It will be much more practical to get up off the stool to get to things that are out of reach. The wobble base does come in handy for making small adjustments in front of your keyboard, but it is not ideal. Another thing to consider is that the Kore Stool does not have seat swivel. If you want to turn in the chair, you need to rotate the base as well. The Kore Sit Stand Stool is a great choice for portability. The stool is small and only weighs about 15 pounds. There is also a built-in lip underneath the seat that makes it easy to grab and hold onto when carrying. 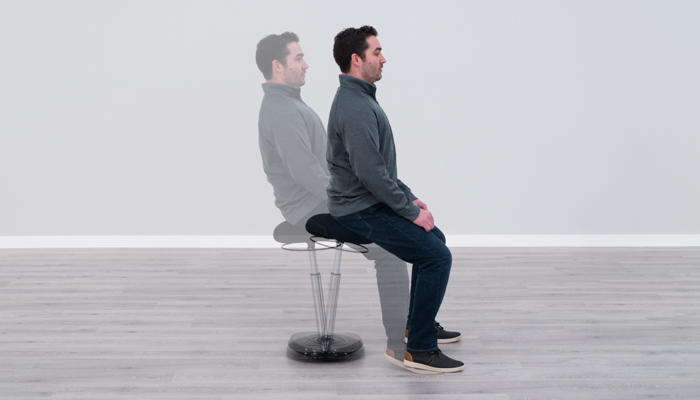 This stool is a nice option for people looking for a product to be used in multiple settings or as a complimentary chair. It is also easy enough to carry that it can be an option to take from office to office in your vehicle. 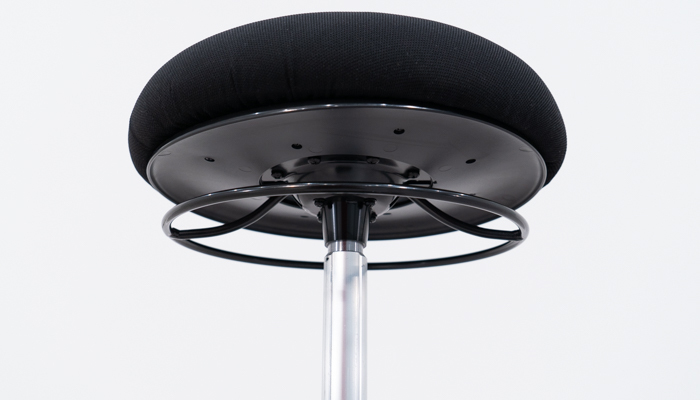 The seat on the Kore Standing Desk Stool is round with a 14” diameter. 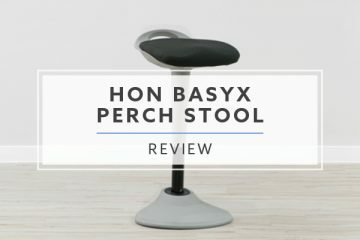 This is quite a bit smaller than the seat you find on normal office chairs, but it is similar in size to a lot of the other standing desk chairs we have reviewed. The top of the seat is slightly rounded so the surface area is a bit smaller than it would be if the seat was flat. The rounded seat takes away some surface area, but the shape makes it easier to perch and lean on the edge of the seat. The seat has thick padding and it is really firm. We have the fabric option. The fabric is not the best quality, but it is not coarse or uncomfortable to the touch. Overall, I did not find the seat to be very comfortable, which is how I have felt about most of the seats on standing desk chairs. I was able to use the chair for about an hour before the seat started to become an issue. 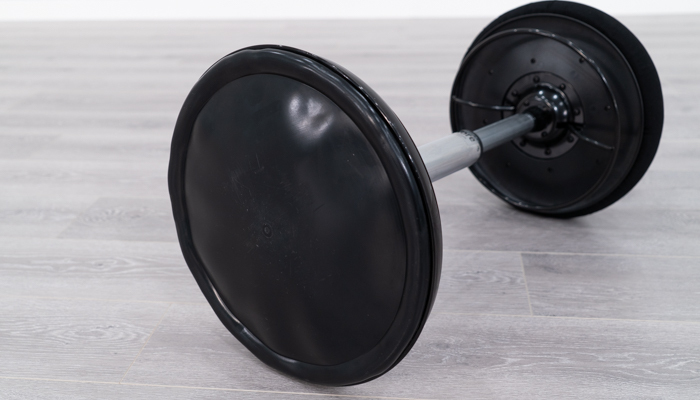 Wobble bases typically offer a wide range of motion because you can move in any direction you’d like and the amount you can tilt in each direction is often unlimited. The Kore Stool features a wobble base, so you do have a wide range of motion, but it is not quite as generous as other wobble base models. There is a safety lip on the base to prevent the chair from tipping too far. This will limit your range a bit compared to models like the Uncaged Wobble and Safco Pivot. While you do lose a little range of motion from the safety lip, you still get a bigger range than most standing desk chairs. 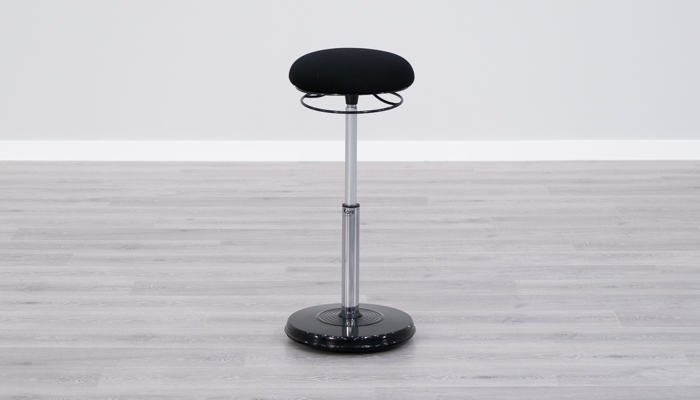 The Kore Stool only has height adjustment. There is a metal ring right underneath the seat. You can press and hold any point on the ring to unlock the gas cylinder, which will allow you to adjust the height. The seat will automatically move up with no weight on it. To move it down, you’ll need to use your weight and push the seat down. There are two popular schools of thought when it comes to office chair ergonomics. 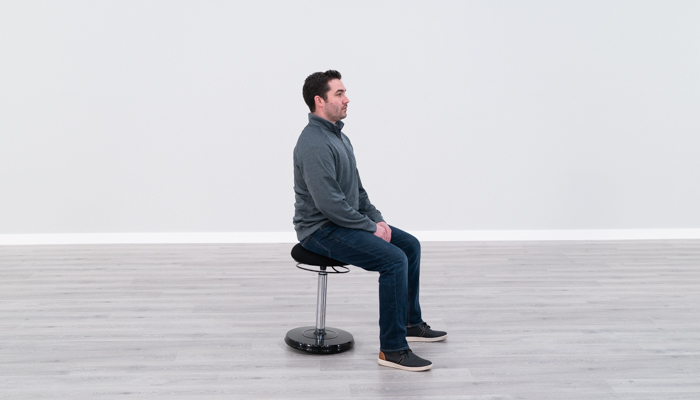 The first is that you should have your knees, hips and elbows are at a 90° angle and that you should take breaks periodically to get out of your chair. The second is to put your knees and hips at a more open angle and incorporate consistent movement while you are sitting, perching or leaning. 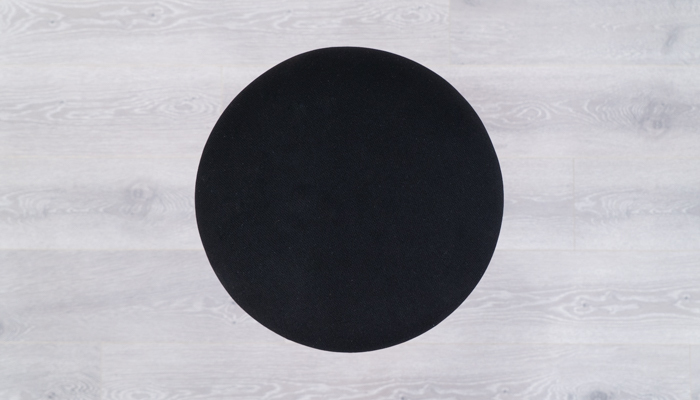 The Kore Sit Stand Stool subscribes to the second philosophy. The Kore Stool is meant to be used as a perching or leaning stool. You can then move while you work. The movement can be very minimal or very pronounced. 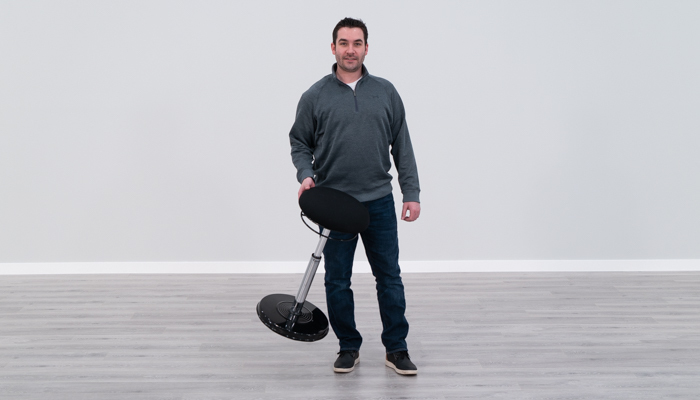 The amount of movement is up to you but some movement is better than no movement when using the Kore Stool. 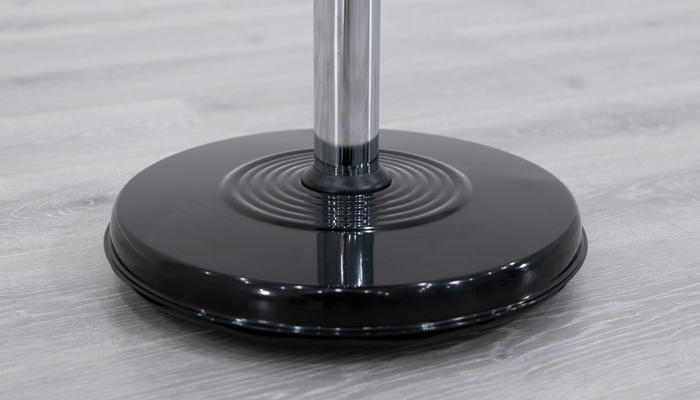 The Kore Stool does have a wobble base, but it has an anti-roll safety ring around the base. This prevents you from tipping or leaning too far in one direction, which keeps you from falling or getting off balance. The bottom of the base also has non-slip rubber. Overall, I found the Kore Stool to be stable while in use and while making adjustments. I really like how easy it is to carry the Kore Stool. It seems like such a small detail but the plastic lip on the underside of the seat makes a huge difference. This is one of the best standing chairs when it comes to carrying it around your office. The wobble base gives the Kore Stool a good range of motion. The only restriction is the non-tip lip on the base, which is actually a nice safety feature. The Kore Stool goes down to 21”, so it can be used at normal desk height. 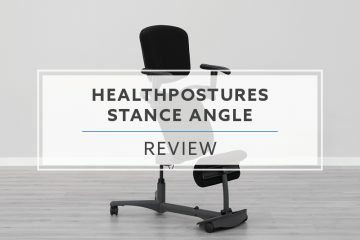 There are a lot of standing desk chairs that are not capable of going low enough to use at a standard desk. The Kore Stool comes in at a price of less than $200 so you are not going to get a product with top of the line parts. You are always rolling the dice a bit when going with a lower priced product because you never know how long it will hold up. The Kore Stool does come with a three-year warranty, which helps to ensure you’ll get a decent amount of time out of the chair. The seat is small, hard and has a rounded top. The way that this chair sits is much different than the typical office chair you may be used to. Not everyone is going to like this style of sitting. I only found it to be comfortable for short periods of time. The tall end of the seat height range on the Kore Stool is shorter than most of the other chairs in the category. This may not be the best option for taller people that want to have higher perching and leaning postures. I found the lack of sitting mobility to be an issue with trying to get comfortable in front of my keyboard. It can take a few tries to get the chair into the right spot so you can lean forward and be at your keyboard. This is not a chair that I would recommend for extended periods of time. I think this chair is best for short periods of an hour or less as a tool to change your sitting posture and get you more active. The Kore Office Plus Standing Desk chair is one of the lower priced products available and comes with a three-year warranty. The wobble base gives it a wide range of motion and the patented anti-tip ring helps to keep you stable. The seat height range goes low enough to use at normal height desks, which is not very common for a standing chair. This chair is also a great option for people that need a stool that will be moved around a lot. It is so lightweight and easy to carry that almost anyone can pick it up and move it around when needed. The Kore Office Plus Stool has some good things going for it, but it also has some downsides to consider. I found the seat to be uncomfortable after a relatively short amount of time, which made it difficult to use the chair for longer than an hour in one sitting. The seat height range is good on the low end for normal desks but could pose a problem for taller people on the high end. The build quality is also a concern because the parts are lower end. I think the Kore Stool can be a nice option depending on your needs. It is important to decide what is important to you to make your buying decision as easy as possible.